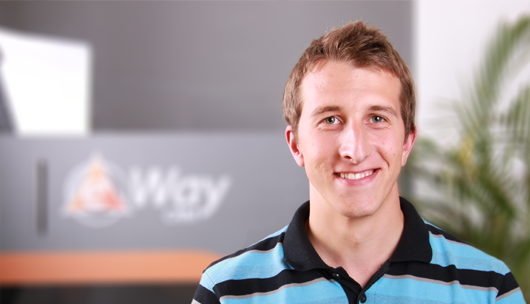 Thanks to our developer and mobile application specialist Stepan Havranek, eWay-CRM Mobile is currently available for Android and will soon be released for iOS as well. What is involved in the preparation and how do the two platforms vary? You were in charge of the development of both of our mobile apps. What was the biggest challenge? Even though eWay-CRM Mobile appears simple on the outside, it works with large data and we had to carefully optimize it so that it can handle such big data offline. It was also necessary to develop the app for each platform individually because we wanted it to be as fast as possible. We started with the Android version first and the stand-alone iOS version followed. eWay-CRM manages a range of things which the user does not see at all. On the back-end, there is a relatively complicated system of permissions which shows only selected content for each user. One employee may see project tasks and contact details, the accountant can follow finances and the manager sees everything including timesheets. This varies a lot. You can make an app in a week, in two days... It appears to me that the majority of the applications available on the market are rushed. But it is not possible to compare an alarm or a notes app with a professional CRM system. The development of an average application takes much less time than in our case. The iOS version took us 4 months to develop and that is after we already had experience from the Android. I feel that most developers are facing banalities compared to what we must cope with. I needed to optimize the entry listing. Our own eWay-CRM contains 250,000 journals and notes which must be readily available. I was browsing various developer forums and couldn’t help but smile a bit when some authors were discussing that their app was lagging with 500 entries. Are the requirements of Android and iOS different? Of course, the work in both platforms is very different as they each use a different programming language, development interface, and way of thinking. It surprised me how imperfect the development interface of Apple was because I always thought that they were a company that did things expensively but well. When you are holding an iPhone as a user, everything is great. You can see that someone worked hard and tweaked every small detail. But when you open the development interface it breaks down frequently and the support is weak. I did not encounter that many problems on Android which also has a better community and knowledge base. But I do prefer Apple’s Swift programming language. Why do I need a mobile app if I already have eWay-CRM on the PC? This is like asking why have e-mail or Facebook on your mobile. It’s not just about having access on the go but using your mobile is simply easier and faster than opening a laptop. The advantages of mobile devices are becoming greater than their creators even intended. The same has happened with our mobile app. When we started developing eWay-CRM Mobile, we mainly wanted to offer a solution to people who were on the move – from sales representatives and managers to anyone commuting to work. But the mobile platform can substitute the computer even more – according to statistics people are more likely to use their mobile than sit in front of the computer. We use mobile phones for answering work e-mails and even at home, we lie on the couch with a mobile or tablet to browse the internet. The mobile interface went through a big simplification compared to the traditional PC and it became more agreeable to the user. So people opt to work with it even when they could just use the laptop. So how can the mobile version of eWay-CRM help me precisely? Does it just copy the desktop version or does it have something extra? Apart from the availability on the go, it offers other smart functions specifically designed for the mobile phone. One click can get you to a map which navigates you to the client. The app also reminds you and helps you to take notes from a phone call and save them under their respective projects or contacts. You have mentioned the offline availability. How exactly does it work? The important thing is that it is real offline. Many apps pretend that they can work off-line but they only use cache and most of your data is missing. When you sit in the subway you cannot access it. Offline is a big advantage and the only drawback is longer synchronization right after installing the app. We recommend using a charger and Wi-Fi. After that one synchronization, the user has all the data available at any time. Doesn’t this go against the trend? It does, but the long-term benefits and user comfort greatly compensate for that. eWay-CRM Mobile is not some game that you randomly download and expect instant fun. Most of our users need a reliable system that they know from the desktop version. The app rewards their patience after the installation with higher productivity. And how does the synchronization work then? From a technical perspective, it is a relatively complicated system the user does not see but profits from greatly. If he is active in the app, the data synchronize almost instantly. But when he is not using it, the app will wake up only once in a while. It also depends on the battery and internet connection. The app limits synchronization when the device is running out of battery and makes it more frequent when the phone is plugged in and connected to Wi-Fi. Do you have any user feedback? What do they like and what would they wish to add? We have received many comments and reactions. Users are applying for testing our app just to have it as soon as possible and they come up with many inspiring ideas. Thanks to our community we came up with dozens of new functions and improvements that we will be gradually adding. Generally, users value the ability to work on the move and compliment us that the app is simple and useful. Some experienced users would like to see advanced content filters that they know from the desktop eWay-CRM which can be configured to the smallest detail. This is a problem on mobile devices though. The display space is very limited and everything has to be simple and clear. I mean you need to be able to control it even while walking on the street. That is why we are currently inventing ways how to add advanced functions to the mobile without bothering the casual user. It is much easier on PC where you can offer many features and allow the user to pick only some. The new eWay-CRM 5.0 is introducing precisely that. Desktop users can now hide any modules and functions and keep only what they need.